“Why is networking so hard?, I was asked. Without much thought, I said, “Networking is like change. Change can be hard”. Where did that come from? Let’s take a look at my thinking and extended response. For the purpose of this conversation, change is the end of one thing and therefore the beginning of something new. 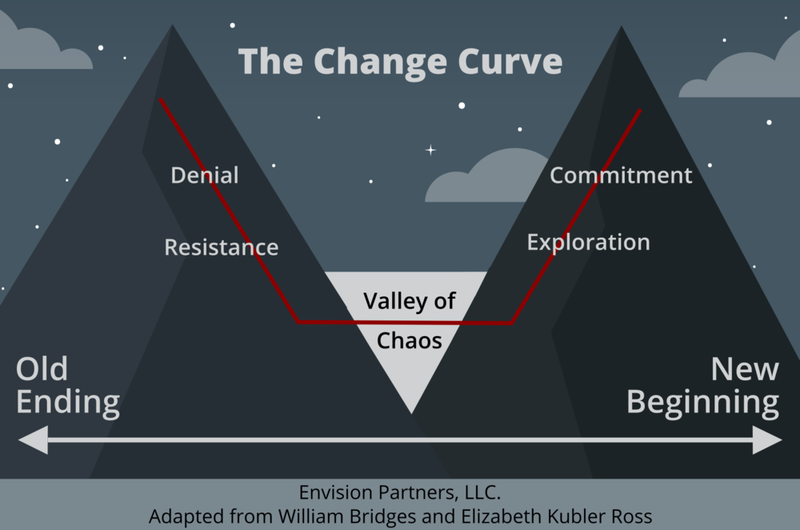 The stages of change are denial, resistance, exploration and commitment. Sales and networking are cousins, so if we have moved from grief to sales, the application to networking is not a hard one. Unlike grief, in sales and networking two parties are going through change. Therefore, it’s about aligning the stages of each party to bring along a customer while you too are going through the discomfort. When experienced, change for the salesperson (networker) is not so difficult, and they are better able to guide the customer (networkee) through their change (buying this product and having less money in their wallet). The question I received was from an inexperienced networker. It was the networker who is having a tough time with the change. We’ll also try to address the difficulty of the networkee. What is ending? Comfort. My personal worldview. Confidence (false-confidence). Faced with this we deny the need to meet new people, to ask for help, to gather new ideas, or to ask people to challenge our world-view. Even when we are in a room full of professionals or have loads of friends, we resist the opportunity to put ourselves out there. How long can this last? Unfortunately, too long. The great idea has passed. The opportunity slips away. Only, maybe as a last resort, at the last moment, we reach out, but only to the closest relationships. How do we start a new beginning? Small talk. Finding something in common with the other person. A question. With all change, success with small explorations leads to more exploration. Which ultimately leads to commitment to the new beginning—that is, a new conversation, a new relationship, or knowledge. A question, rather than a statement, gives the other person an easy opportunity to engage in this relationship too. Starting your conversation with a question is a way to get the other person through their change curve too. The question guides them out of their comfort zone, and the response is their version of exploration. (Unless you have something outstanding to say, listening is not really an exploration that easily leads to commitment.) If their response goes successfully, then they are more likely to commit to continuing the conversation. Therefore, you should show interest in their answer and even ask a follow up question to further promote commitment. In this way, you are the experienced one who guides the other person to buy your product (you) and give you their insight.